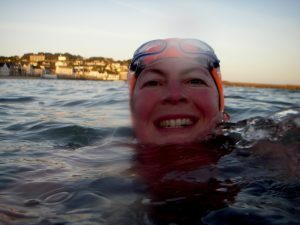 When Mr B2 bought me a ticket for the Outdoor Swimming Society’s Dart 10K swimming event back in January (a birthday present) I thought it was a really good idea, in fact it was my idea. He, very sensibly, suggested that I might consider trying a shorter event first (at the time even 1K would have been a challenge) but I, being Blonde and stubborn, insisted. 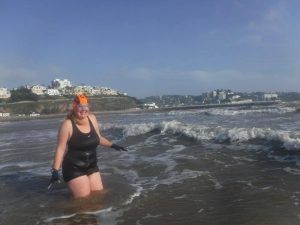 The Dart 10K is the Devon wild swimming event and I wanted to be part of it. I know this sounds silly, there will be plenty of support craft there and I know we have to keep to the right and head downstream, but I won’t have one of my trusty Ordnance Survey maps or know what is round the next corner. I have kayaked and canoed this section of the Dart a few times and camped on the banks at Sharpham but rivers (I have discovered) look very different from ‘fish level’. This is also very silly. I will be in the ‘Leisurely Wave’ wearing a yellow hat and we are leaving Totnes first. I imagine I will quickly be overtaken, first by red hats, then white, then blue (these ‘Elite’ swimmers will be setting off 45 minutes after me). The thought of being left, bobbing around on my own in a very big river does not appeal, although the good thing about rivers is that they have edges. I have no idea how much ‘enough training’ would have been but I am fairly sure I haven’t done it. With a month off after an operation, I have swum outdoors almost every day since November and in a variety of outfits, locations, light levels and temperatures but distances approaching 10K have always evaded me. This week has been a series of 1K sea swims so I know that my arms and legs are working and that my wetsuit is chafing… but that is just about all I know. In the spirit of delicacy (which I do, on occasion, find I have) I am not going to say too much about this topic but put together the combination of morning, nerves, wetsuit and Portaloos and I am sure you can work out what I mean and why it has been the ‘swimming’ thought that has been most occupying my mind! The only thing a girl can do in these challenging physical situations is to give it a go. I have done scary things before (and I am not talking about Portaloos now), sometimes with success and sometimes without it. If you happen to be wandering along the banks of the Dart tomorrow, give me a wave and a shout of encouragement. 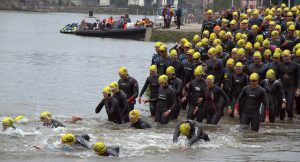 I will be the one in a dark wetsuit and a yellow hat!! 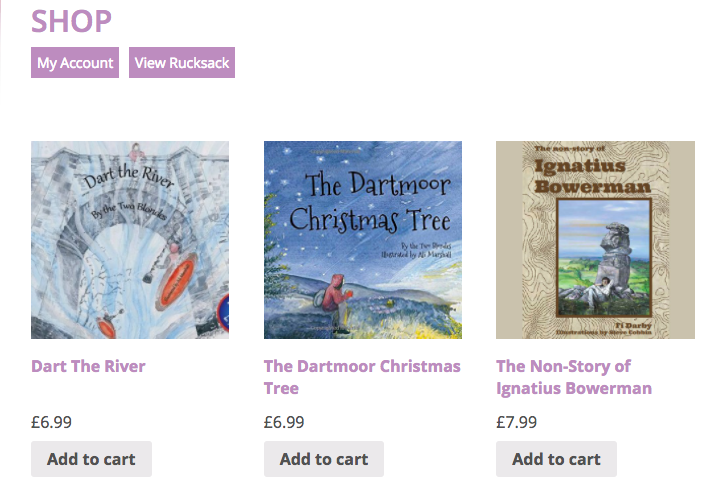 If you and your family love the River Dart (or any river) as much as I do then you might be interested in our children’s story book ‘Dart the River’, which tells Dart’s story from his beginnings high on Dartmoor down to the sea at Dartmouth. Beautifully illustrated by my sister Ali Marshall and available from our shop. Order your copy today. 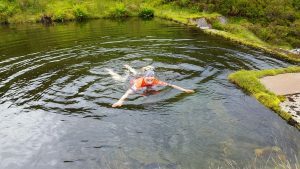 Thank you – I have it on good advice that there will be jelly babies on the way, so worth swimming for! I am sure you will do fantastically well. 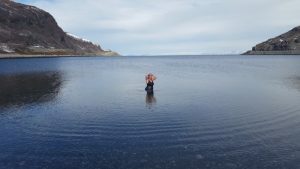 Getting in the water is more than I would achieve! I guess there won’t be much choice about getting in once I am there in a wetsuit! If you go at it thinking you will struggle or fail then it is likely to become a self fulfilling prophesy. Swim it as your own swim and ignore everyone else around you. Unless you are an elite swimmer it is NOT A RACE against anyone but yourself. As for pre-event nerves, IT IS NOT A RACE. I worked this out a long time ago when I used to run 1/2 marathons and the like. 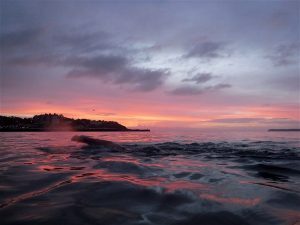 For you it is just another ordinary swim, same as yesterday and the day before, different scenery maybe and there are a lot of other people about for some strange reason. Ignore them, go at your own pace and soon you’ll have a finishers medal, it really is not that far, I’ve done it and more besides. If you let yourself get wound up you will go off too hard and that’s where it all goes wrong I have seen it so many times, people I knew were runners of about my pace charged off from the start line and I cruised by them at the 1/2 way mark. If fact one of the best 1/2 marathons I ever ran I started right at the back, it is very uplifting to be always passing people! Thanks Chris. I am trying both mental approaches, I promise. Part of me is looking forward to it, the Dart is a very special river and this is a new way to explore it. Good luck and remember to enjoy the experience. You are not alone in these thoughts! I’ll be thinking them all (and then some!) alongside you somewhere tomorrow! Good luck!